One would have thought the search giant Google would have learnt some valuable lessons from its last venture into direct sales when it launched the Nexus One mobile phone. The company came in for much flack over poor customer support and slow deliveries in early 2010 for its flagship mobile phone. The issues were less about the Nexus One itself and more about Google's online-only approach to support. US customers could only buy and get support for the Nexus One online, mostly through help forums, which Google supposedly monitored. However many complained they were not receiving an adequate service from the company. As a result of the shambles seen in the US, Google launched the Nexus One via retailers in other countries. But now Google has made another balls-up with its launch of its much lauded Nexus 7 tablet. While Google has allowed retailers to stock the device, there are as yet few signs of the Nexus 7 in shops. Retailers report conflicting dates on when the tablet will be available and a visit to several stores on Wednesday saw no sign of the tablet. On Wednesday, the Dixons Retail group, which runs Currys and PC World stores, said the Android slate had gone on sale. But, later in the day Dixons representatives said they had got the date wrong, and the Nexus 7 would only be coming out on Thursday! With the cheaper 8Gb version only available online via the Google Play store, many consumers have opted to get the device delivered. But many of these customers are sorely disappointed despite paying out an extra £10 for delivery on top of the £159 for the Nexus 7 itself. 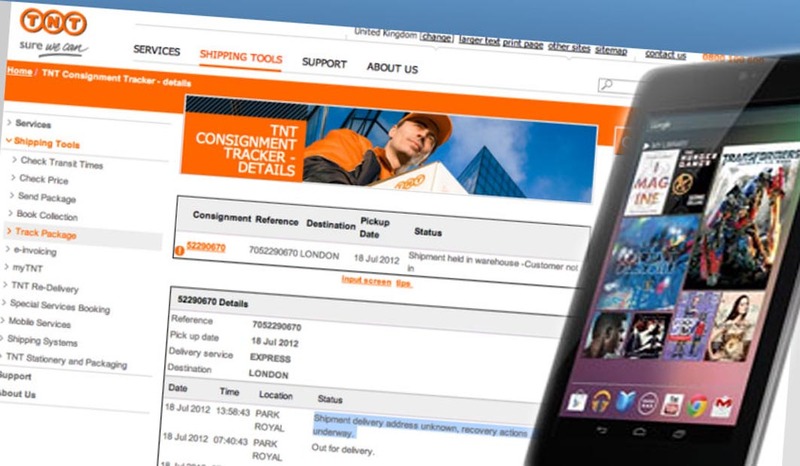 There are reports that Google has failed their customers in the UK by passing on incomplete addresses to courier TNT, and as a result the deliveries cannot be made. In one case a Nexus 7 was addressed to "Basement flat, basement flat, London". It is of no surprise that TNT were unable to deliver the package. Since it was not the fault of TNT, the courier company has referred customers to Google and told those not receiving their package to call the Google Play contact number [0800 328 6081], which diverts to a US call centre. But that has not proved useful and with customers said to be experiencing long delays in getting through to a representative from the company. Users who have managed to get through have received less than helpful advice according to some reports [The Inquirer / ZDNet / Register]. While the Nexus 7 has received broadly positive reviews, the issues surrounding its delivery may dampen the enthusiasm and could hit future sales. With Tesco suggesting they may sell the 16Gb version for only £189, instead of the online price of £199, a price war is all too possible. But the bad press, should the delivery situation not be rectified and resolved, could further ruin the reputation of a company which prides itself with delivering the best search results and organising data. It is unfortunate that the company seems unable to have the same success in the physical world of delivering goods and customer satisfaction.